Dorcas Gatari was nervous the first time she got in line Friday morning at the University of Missouri–St. Louis’ Spring Career Fair inside the Mark Twain Athletic Center. She wasn’t sure what she was going to say to when she got to the front. “I had my elevator speech, but then I forgot it,” Gatari said. 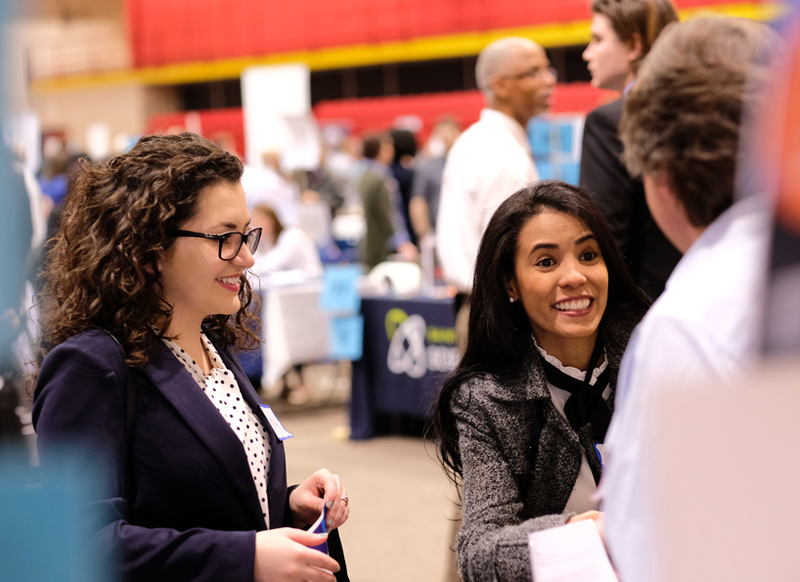 But she took some cues after watching how some of her peers approached talking to representatives of potential employers, and the nerves quickly faded when her turn came. 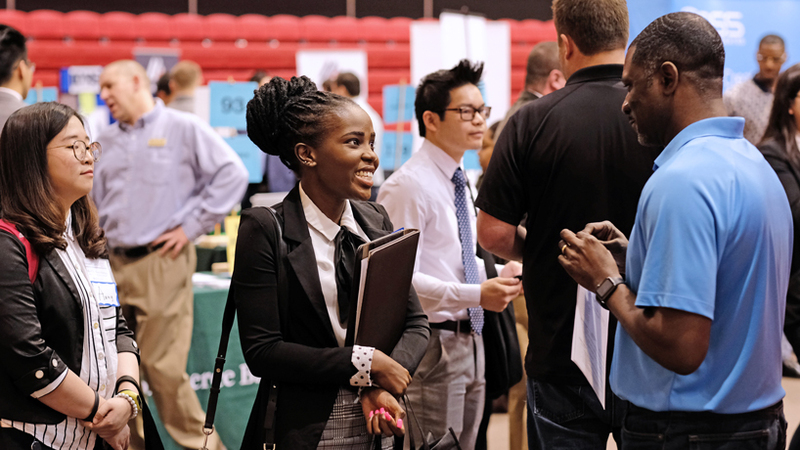 Gatari, who came to the United States from Kenya as a senior in high school and graduated from Hazelwood West High School, is now in her senior year of college majoring in business administration with an emphasis in finance. 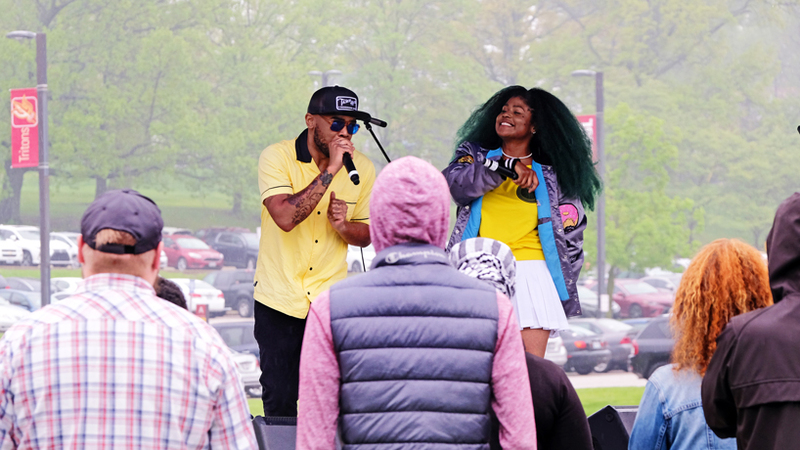 She is looking to land a summer internship that can give her a chance to try out some of the knowledge she’s acquired at UMSL and gain some work experience before she graduates in December. 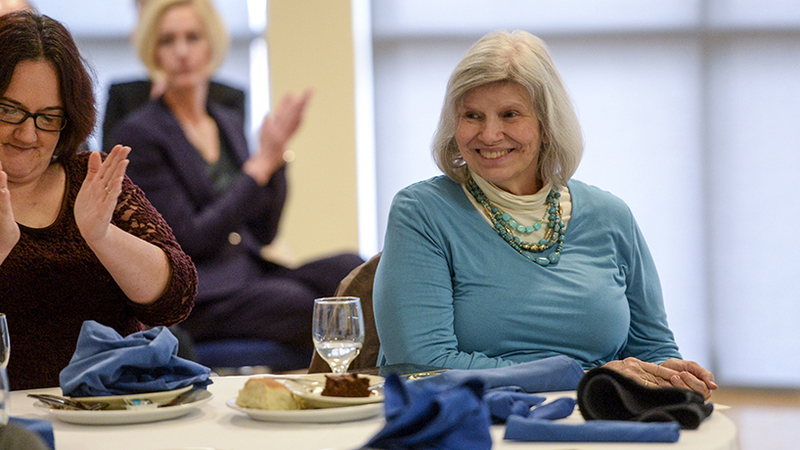 She was among the more than 300 students and alumni who attended Friday’s fair. Even before walking into the gymnasium, Gatari had identified eight companies she wanted to make contact with among the 120 businesses and other organizations that had representatives in attendance. They included Ameren, Commerce Bank and Express Scripts. She had an extra long chat with the representative of Cushman & Wakefield, a commercial real estate services company. “He told me they have an internship position for 10 weeks, so I’m really hoping they’re going to contact me back,” said Gatari, who is interested in becoming a financial analyst. 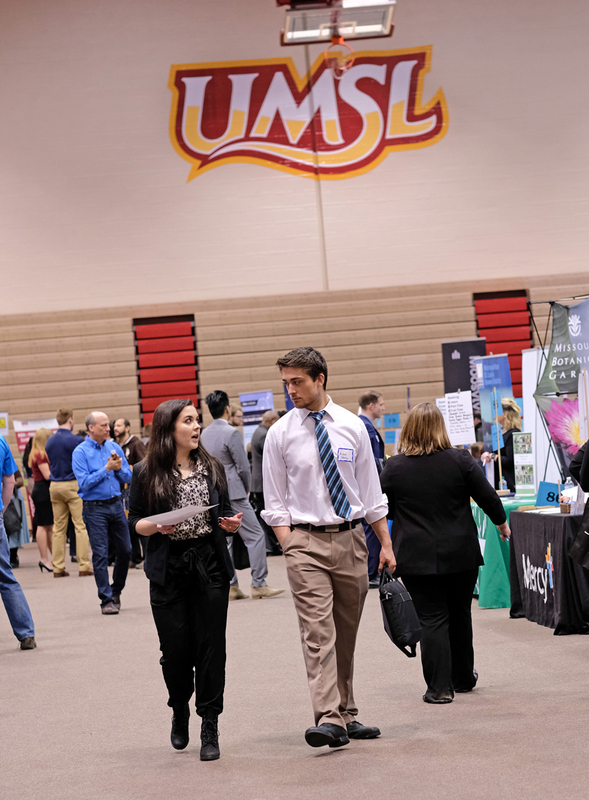 Senior chemistry major Anastasia Jensen (at left) was attending her fourth career fair since transferring to UMSL in 2017. 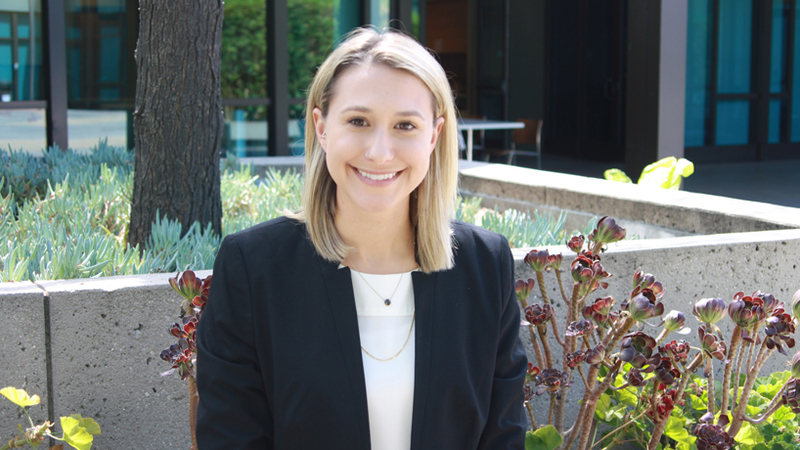 Last spring, she landed an internship at biotechnology company Elemental Enzymes. Jensen was helping her friend Carmen Proctor (at center), a junior transfer from St. Louis Community College now majoring in business administration, learn the ropes at the career fair. “I’m just following her, and she’s giving me some advice on what to do,” said Proctor, who’s searching for an internship opportunity. Jensen was confident as she made her way around the room, stopping at the tables of companies she’d identified in advance. She was ready to reach out with a handshake and introduce herself. Her first conversation Friday was with Steve Kolodziej (at right) from Pfizer. Kolodziej earned both his bachelor’s and his PhD in chemistry at UMSL, the latter in 1992, and was representing Pfizer for the third time at an UMSL career fair. Not every representative on hand came with a list of specific jobs their organization was looking to fill. For large companies such as Edward Jones, such a list is too long and ever-changing for people to keep track of. 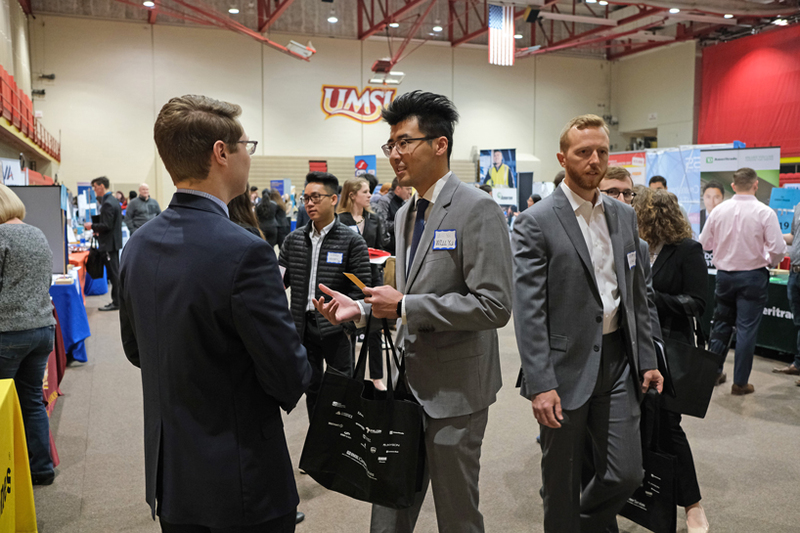 Alumnus Sean Fieser (at left, talking to current student Will Yu), a 2015 BSBA graduate, hoped he could provide another service to UMSL students while representing Edward Jones for the first time at a UMSL career fair. That’s why he volunteered for the assignment. “One of the things that is nice that we’re able to help students with is giving them a cultural background for an organization and what the company does, and definitely we can provide direction to students on what they may or may not have interest in,” Fieser said. He did have his eye out for students who could fill co-op positions at Edward Jones next fall. Fieser was grateful for the opportunity to help out students at his alma mater. Siblings Millie (left) and Aiden Worley (right) have different majors and are at different points in their academic careers, so they had different goals as they made their way around the room at the career fair. Millie, a junior majoring in communication, was just on a fact-finding mission about potential future employers. “I currently have a job that I really like, but I’m looking for the future and what I want my next steps to be,” Millie said. She works for a commercial real estate company but is interested getting more involved in marketing and social media. 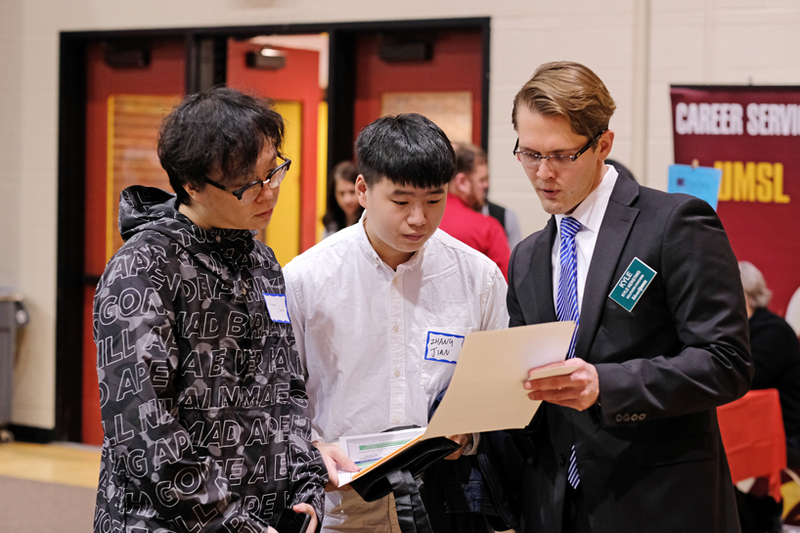 Aiden, a senior majoring in business administration, had been to career fairs before at UMSL. This year, he was hoping to get a lead on a summer internship, a requirement to complete his degree as early as this summer. He came with three or four targets in mind and made contacts with each, including Save-A-Lot. Jian Zhang (center), a native of China, came to UMSL looking to follow his father into a career in business and is now majoring in business administration with an emphasis in finance. He too was looking for internship opportunities Friday with his graduation date still more than a year away.